All three of my boys are in some kind of classroom this year, and that means making Valentines for a lot of people. I'm not a big fan of the store bought kind, although I have used them in the past. This year, we've managed to get ahead of the game a bit and make some handmade Valentines. Alas, these Valentines were already sent to school to be put in the big Valentine class box and I forgot to snap a picture of our version. We found this great template at Skip to my Lou and my six year old had a great time cutting out the wings and writing his classmates' names on them. We changed it a bit and wrapped each lollipop top with black tissue paper and added pipe cleaner antennas. We also did orange and blue wings for the boys in case any of them thought these were too "girly". That's a big deal in first grade, ya know. I fell in love with this idea as soon as I saw it on Thirty Handmade Days. Great for my younger two who go to autism and speech therapy preschools, both classes which are all boys. I love the back of the label with the tire tracks. There, much better! Cream vinyl heart cut from my Silhouette. We are ready for the class parties to begin. Your craftiness knows no bounds--it kind of blows my mind! Also, you are incredibly thoughtful and your generosity is inspiring! Can I be like you when I grown up? 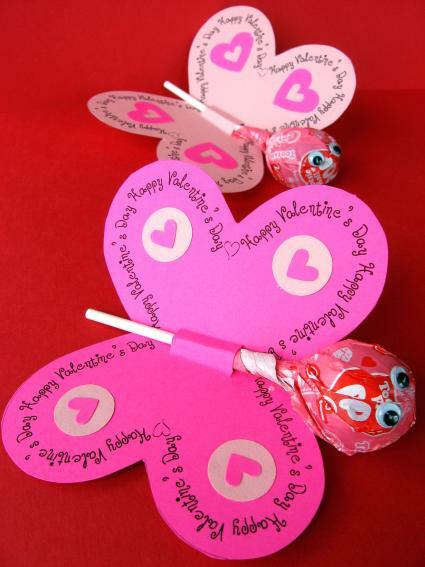 Im remembering these ideas for valentine futures. The bottles were originally Frapacino bottles, right? Those are all so great. I love seeing the projects you do.